Are you a fanatic of lime green colors? These earrings are a great way to flaunt that special love of this gorgeous and trendy shad of green. These are genuine 6mm Peridot studs in a beautiful 14K White Gold frame, which really helps the colors shine and stand out in an amazing way. The best part is that the wonderful earrings are in a heart shape, which is a great addition to add the look of elegance to this fine piece of jewelry. These earrings are accompanied with push back closing, which completely secures the earrings in place all night until you are ready to take them off! The push back also prevents pinching and any discomfort that may arise while wearing these beautiful earrings. 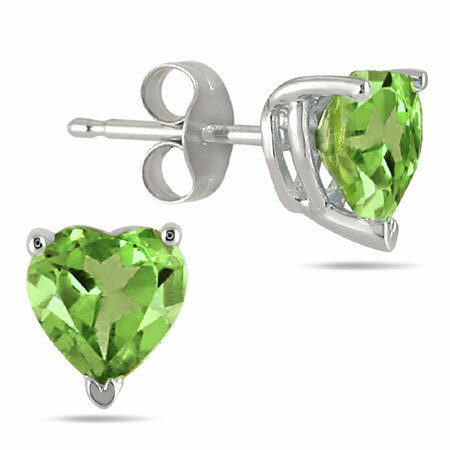 We guarantee our Genuine 6mm Heart Shaped Peridot Studs, 14K White Gold to be high quality, authentic jewelry, as described above.